On 13th of January on the highest positions on the monitor, joined new Golden Stage project called POKERIRON with $400 reinvestment. For this administrator, most important thing was his listing position and Pinned Golden Stage listing position nr. 2 was not enough for him. That is why administrator has reserved the highest (1st) place as soon as it is available. There could be two explanations for such behavior, first - administrator wants to make an impression of a high budget project or second - POKERIRON is a big budget project, and most important thing for this project is an impression. 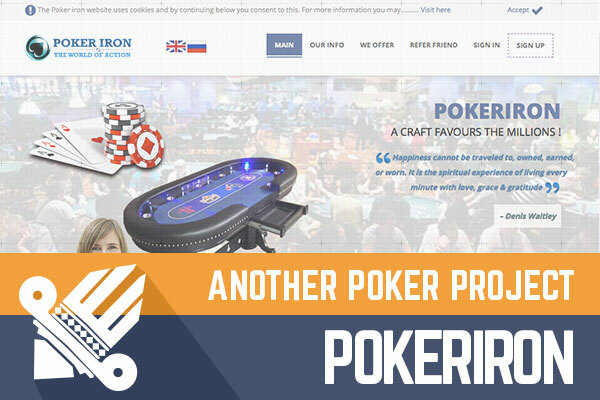 When we open POKERIRON site first impression is positive. It is clear that in development have collaborated several persons, but I have this feeling that native language of people that have developed this project is not English. The project is available also in Russian, and it might be that administrator comes from Russia or some Russian speaking country. Apart from numerous spelling mistakes on the website I like that site is packed with a lot of information and video materials what is essential for every potential investor. If we relate this project with "HYIP poker grand" of today then of course in this project is not that much information as there, but if administrator works hard, I'm sure this site will get filled with more and more valuable information. POKERIRON actively works on marketing, and it is likely that there are quite a lot investors already invested, but the main reason people would like this project is attractive investment plans. I like POKERIRON investment plans and as I see from forums people like them as well. Sure thing, 74 pages of comments on mmgp.ru within 74 days online is not much, but I guess it just shows that more members are real investors, not monitors. In any case, real statistics knows only administrator himself. In any case, if you plan to invest in this project remember that we are in HYIP industry and spend only that you can afford to lose. Investment plans: 3.5% up to 6.2% daily for 45 calendar days, initial deposit included in the payments. 110% after 10 days, initial deposit included in the payment. Forget other investment plans. At Take Free Bitcoin you may recieve FREE bitcoins. 8 to 22 satoshis per 5 minutes. Have you ever considered automating your free BTC claims by using a BITCOIN FAUCET ROTATOR?